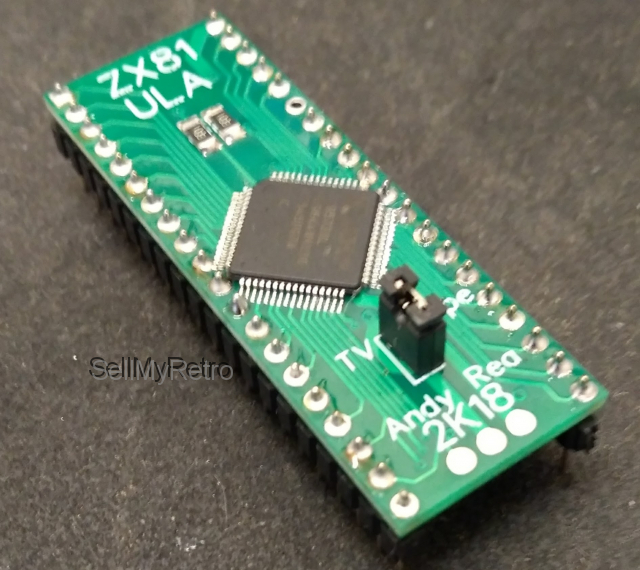 as some of you may be aware i have developed and built another ZX81 ULA based this time around Xilinx CPLD. On board crystal oscillator for improved frequency control. M1not can be enabled easily. anyway... words are not my thing... simple guide here. P.s more will be listed soon, so dont worry if you dont get one this time. Last edited by Andy Rea on Fri Jun 29, 2018 11:42 pm, edited 2 times in total. Well they went fast! Will be building more this weekend so check back Monday. Thank you to those that were quick enough. I was most surprised by the first buyer... The link had not even been posted here at that point.... However it was late so I went to bed. When I woke this morning it's time for work so I will be packing today and posting tomorrow. Hope this is acceptable. We haven’t got a replacement ULA for years, so you came at the right time. Wait a week and there will be more. Hi will be making more over the weekend, keep your eyes peeled late Sunday night or Monday morning, I'll post here again when re listed. A nice piece of work Andy that takes care of the only worrisome bit of the zeddy, the ULA. Z80's, caps, resistors and even a quick flash job for the ROM no worries but this bloody thing was always at the back of my mind insomuch as when my last ULA's hit the dirt what then? Hopefully now problem solved. Great work as always Andy many thanks for this.